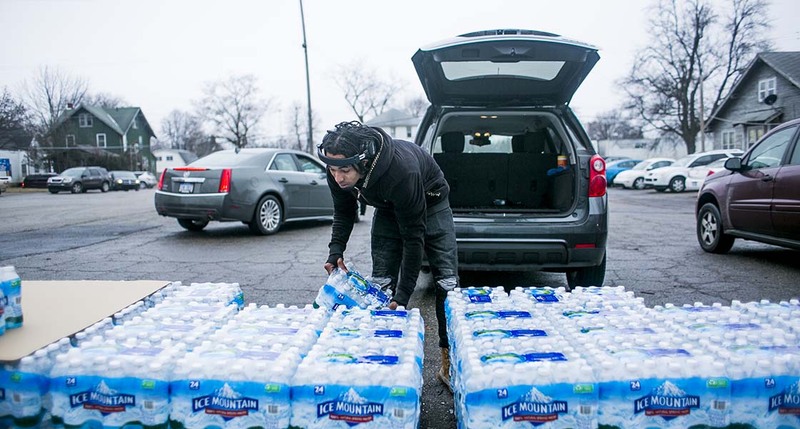 Nestlé Waters North America will provide free bottled water to Flint residents through August — adding four months to its donation plans, the company told Bridge Magazine on Wednesday. Since May 2018, Nestlé has provided 100,000 bottles per week of Ice Mountain water to three volunteer-run “help centers” that continue to face high demands from residents still wary of tap water nearly five years after a contamination crisis. The conglomerate, which has faced controversy for its extraction of 210 million gallons of water per year from central Michigan, had previously promised to donate water to Flint through April. Before Nestlé announced the extension, it wasn’t certain if residents could continue to receive free bottled water after this month. “We have worked closely with the state, [Flint Mayor Karen Weaver], non-governmental organizations and the Flint community to understand how we can best help meet their needs, and we have offered to continue our bottled water donations through the end of August 2019,” Jason Manshum, Ice Mountain community relations manager, said in a statement. The extension will bring Nestlé’s donations to more than 6.5 million bottles of water since May 2018, Manshum added. Weaver welcomed the extension, which WNEM-TV first reported. “I am grateful to Nestlé for honoring my request to extend supplying bottled water to our help centers through August. After some conversation, we were able to solidify a few more months of water donation,” Weaver said in a statement. The water is necessary because many Flint residents have no faith in what flows from their taps, nearly five years after errors by state officials exposed Flint residents to elevated levels of lead and bacteria. Michigan regulators declared the city’s drinking water safe from lead one year ago, but residents don’t trust the government, and some continue to report discolored, smelly and foul-tasting municipal water. Flint, led by an emergency manager appointed by then-Gov. Rick Snyder, switched drinking water sources to the Flint River in 2014 to save $5 million. The state approved the change but didn’t require any treatment to control corrosion of aging water mains, a measure that would have cost less than $40,000 per year. The highly corrosive Flint River rusted the mains, causing lead to leach into drinking water. After state officials declared Flint’s water “restored” last April, Snyder’s administration stopped offering free bottled water, a service The Flint Journal reported cost $22,000 a day. That’s when Nestlé stepped up. The company, which had sales of about $8 billion in 2017, has touted the donations to Flint in commercials amid ongoing controversy about its water withdrawals in central Michigan for Ice Mountain. Nestlé confirmed its extension to Bridge the same day as Gov. Gretchen Whitmer faced questions during an MLive/ABC12 event about whether the state would resume its program. Whitmer said she hoped Nestlé would provide water until Flint replaces all of its lead water service lines. Flint has swapped out more than 7,900 lead service lines since 2016, using state funding guaranteed by a legal settlement. The city likely has thousands of more pipes to go. Whitmer acknowledged Flint volunteers’ ongoing challenges in delivering bottled water to elderly, frail and otherwise homebound residents since the state-funded program ended. “I’m going to take a look at it and see what we can do,” she said Wednesday. In January, the Department of Environmental Quality announced Flint’s water tested far below the federal “action level” for lead during the second half of 2018 — just 4 parts per billion compared to 15 parts per billion standard. It was the fifth consecutive six-month monitoring period Flint was below the federal standard, putting its water at or below lead levels in 96 other Michigan cities. In independent testing required by a legal settlement, researchers at Michigan State University and University of Notre Dame found the same results as the DEQ. Public health experts have long said the federal standard does not fully protect public health, and no level of lead exposure is considered safe. But residents continue to report discolored and smelly municipal water, and have received mixed messages about protections against bacteria. I understand the mistrust in government on the other hand who are they going to trust. The lack of trust is a real problem and can only be addressed by the truth. My opinion is that providing water in pint containers is not a viable solution to the problem. 21/2 gallon reusable or disposal containers are available at a reasonable cost in volume that would be needed. These containers can be refilled many times and have easy to carry handles. Setting the container on the counter and fill a container for drinking or cooking proposes I feel would be a better option. Just one idea and hopefully others will add their comments. So Nestlé is donating 100,000 half-liter bottles a week . . . let's see how much that really means. Nestlé now has an expanded Mecosta County pumping license for 400 gallons a minute. One gallon is a bit over 7.5 liters, so that license lets them fill 6,000+ bottles a minute. Which means the donation takes up less than 20 minutes of their production every week. Or look at it from the other end. A week is 168 hours -- or slightly on the high side of 10,000 minutes. So out of the 6,000+ bottles Nestlé fills every minute, they're donating not quite ten. And for a third view, remember that the population of Flint is just about 100,000. So the donation amounts to one half-liter bottle a week for each of them. No wonder the people of Flint are underwhelmed by oh-so-publicizeable generosity of Nestlé -- and still overwhelmed by the catastrophe imposed on them.